I think, in my lifetime I have probably tried virtually every different kind of abrasive and power sanding aid that has been available. Some of these have been extremely effective and others less so. One of those that I have not generally been impressed by has been the thin belt-type power sander similar to a narrow file. I have had only limited success with it and have been worried about its propensity for shooting the belts around the workshop during its operation. It is obviously a useful machine as it has been around for many years, so I have assumed that the fault probably lies with the operator. Having completed this test using the 9031 and 9032 sanders from Makita, I must admit to having a complete change of heart. While the test was by no means extensive, I think I gave both of them a good enough chance to show their good and bad points. My carving team are currently involved in carving a nearly full sized seated lion out of moving Nigerian satinwood (Distemonanthus benthamianus) to go into the National Memorial Arboretum in Staffordshire. This wood is not only very dense but it is also extremely difficult to carve, so we thought it would be a good test of the machines' ability. We started by trying out the 9032 with the 40 grit belt to see just how much wood it would remove and how it stood up to heavy work. Our immediate reaction was that you could actually carve with this, if you wanted to, removing wood very quickly and safely. The two-handed action made it a pleasure to use. Once we put a finer belt on it it was a different machine, capable of producing a smooth finish even on the most difficult grain areas. It obviously was not really suitable to go into difficult to reach areas as it really does need to be used two-handed. We all felt that this is a tool that has a place in any workshop and, with practice, could be used on a wide range of surfaces and materials. Care needs to be taken to ensure that the edges of the belt are not allowed to dig into the surface of the wood but we found it didn't take long to get used to the sanding action. 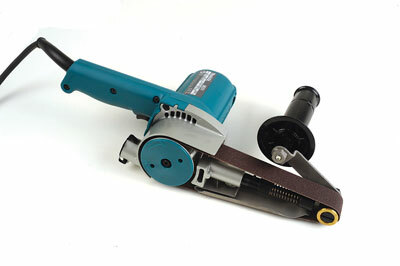 The smaller tool was more limited as it only has a belt 12mm wide so is not really suitable to sand large surface areas. However, it makes up for this with its ability to sand in difficult to reach areas and cope with finer detail. 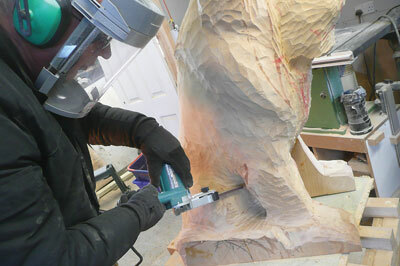 It was made to work quite hard and at no time did the belt jump off the sanding arm. We agreed that it is a very different machine from any that we have tried before but, then this is no doubt reflected in the price. 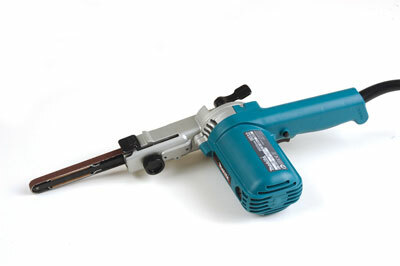 We were not given the prices of either machine as we were asked to test for efficiency not value but, having owned a wide range of Makita power tools over the last few years, I have come to wonder why I bought cheaper tools for so long. All that I have tried, these included, have been quality tools, not cheap but definitely well worth the money. If you wish to carve large pieces or sand any sort of complicated shapes, then both of these tools from Makita are well worth adding to your existing tool kit. I must see how much sanding I can get done before I need to send them back!